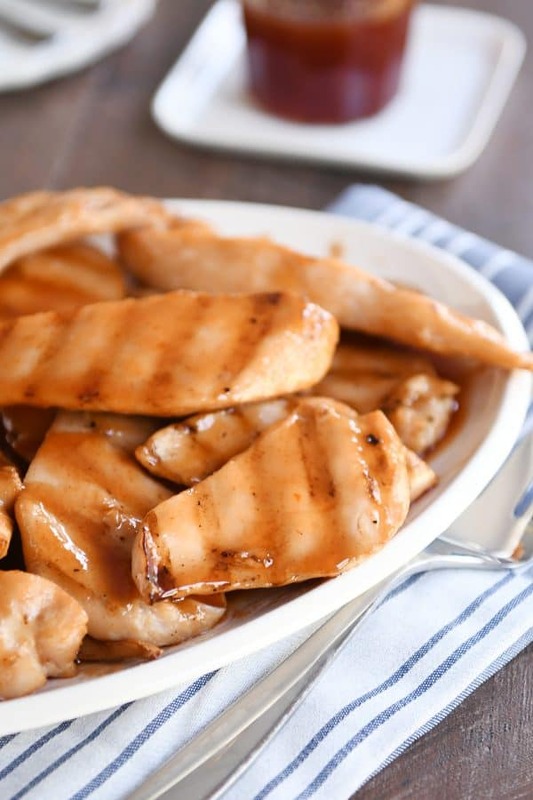 A healthier take on the popular classic, this grilled sweet and sour chicken is fantastic! Thanks to a quick brine, the chicken is ultra tender, and that homemade sweet and sour sauce is divine (as always). Disclaimer: Traeger Grills sent me a pellet grill to test out, but as always, all opinions and thoughts I share here are 100% my own. It’s no secret we are huge sweet and sour fans here in the remote wilderness of Idaho. This baked sweet and sour chicken is one of the most popular recipes on my site (with almost 1,000 comments and tons of 5-star reviews), and it is still Brian’s favorite meal of all time after all these years. I was making it long before I ever had a blog. And it’s the recipe most other “baked sweet and sour chicken recipes” around the internet hail from. I’ll never stop making it, but I’m not going to lie, I’ve been wanting to make a quicker, grilled version for years – not only to eliminate the somewhat messy breading step but also for a healthier take on the popular classic. This grilled sweet and sour chicken is crazy delicious. 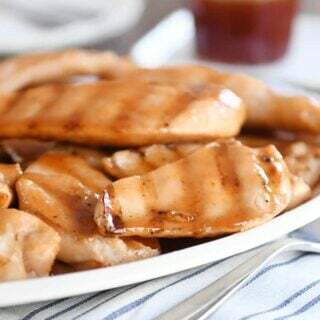 It might look as simple as slapping some chicken pieces on the grill, slathering in sweet and sour sauce and calling it good. But you know me better than that, right? There’s always a back story. A philosophy. A reason for the deliciousness. First of all, the chicken gets a quick brining action that adds a ton of flavor and ensures super juicy and tender chicken. Brining is basically a water + salt + sugar bath for the chicken, and you don’t want to skip it for this recipe. Trust me. Flavor! Juiciness! Love! Happiness! It’s all yours if you brine that chicken. 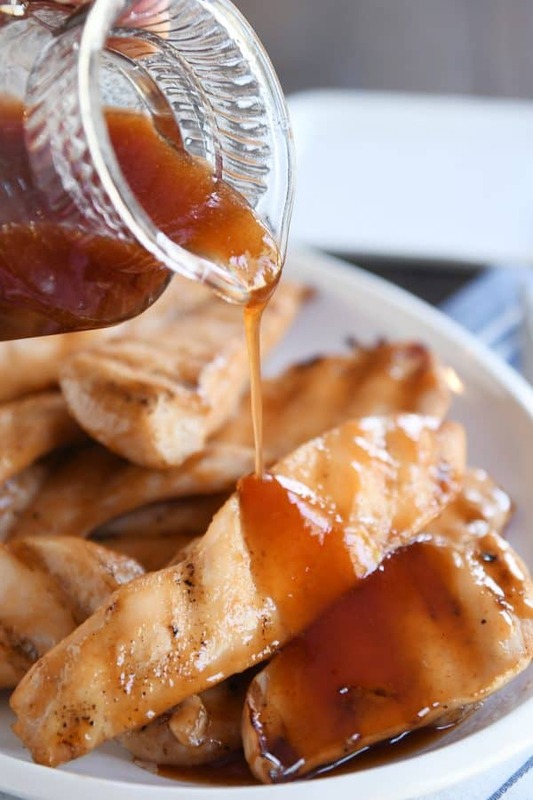 Second of all, while you could totally opt for a store bought sweet and sour sauce, I’ve learned not to mess with a good thing, so I brought in that insanelypopular (and super simple) sweet and sour sauce to use for this grilled version, and it’s definitely a match made in sweet and sour heaven. The sauce gets a quick simmer on the stovetop to reduce and thicken just a little. And then it’s ready to get brushed on the chicken during the last few minutes of grilling…and drizzled liberally over the cooked chicken. Even though some may wonder about alternative cooking methods, I highly encourage the grilling action for this recipe (although, fine, you could experiment with cooking in a skillet or broiler). As I’ve mentioned many times over the years, I use my pellet grill/smoker for grilling. Traeger Grills recently sent me a new pellet grill to try out (it’s what I used for this recipe! ), and it again confirmed to me that pellet grills are my jam. I love them – the flavor, ease of use, everything. In the meantime, make this grilled sweet and sour chicken! It is a delicious summer meal that takes regular ol’ grilled chicken to a place where you may want to be eating it every single day. For the chicken, prepare the brine by whisking together the water, salt, brown sugar and soy sauce in a large bowl until the sugar and salt are mostly dissolved. 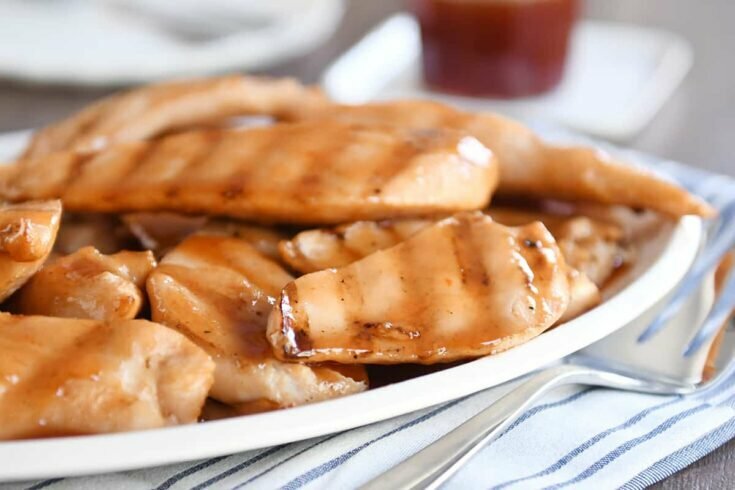 Cut each chicken breast into 2-inch strips (so about two strips per chicken breasts, depending on the size of the chicken breasts) and submerge all the chicken pieces fully in the brine mixture. Cover the bowl and refrigerate for at least two hours (or up to four hours). Any longer than four hours and the chicken may be too salty. For the sauce, whisk together all the sauce ingredients in a medium saucepan and bring the mixture to a simmer over medium-low heat. Let the sauce simmer for about 15 minutes to reduce and thicken slightly (can simmer longer for a thicker sauce), stirring occasionally. There may be a strong vinegar smell as the sauce simmers and the vinegar evaporates - that's completely normal (and the sauce will not taste overly vinegary). Preheat grill to medium heat (on my pellet grill, I preheat to 350 degrees for this recipe). Remove the chicken from the brine and pat dry with paper towels. Discard the brine. Grill the chicken, turning once, until an instant-read thermometer registers 165 degrees F (exact cooking time will depend on what type of grill you have; it takes about 15 minutes total on my pellet grill for thin cut chicken at this temperature). During the last two minutes of grilling brush the chicken liberally with the prepared sweet and sour sauce. Remove the chicken from the grill to a serving platter and drizzle with remaining sauce OR serve the sweet and sour sauce on the side. You can use up to four pounds of chicken using the same amount of brine. This is amazing!! Our family loves the original and I do too but I too don’t always love the process Thank you!! so glad I saw this post! Normally, I automatically skip the grill recipes. This time I didn’t, and we’re so glad. It was delicious! My husband mixed the sweet and sour sauce with a little garlic chili paste–wonderful. Thanks for all your recipes–this is the only place I really look for new recipes any more. By the way, I’ve found many, many recipes through your links to recipes posted on that day in previous years. Is that not going to happen any more? Hey Tabitha – glad you loved this one! Yes, I try to keep the one, two, three (and more) past year links in the posts, but sometimes I forget to add them. I’ll try to get them in future posts for sure! Yay! Glad to know that. Just in case anyone is wondering…this is officially a “unicorn” meal! We fed it to a group of 15 people (8 of them were children). Everyone gobbled it up with rave reviews! Easy prep, budget friendly, & kids & adults loved it!! Unicorn meals for the win! Haha, I’m going to start using that phrase! We made this tonight for our family vacation dinner for 15 people, including 8 kids under the age of 9. Not one child complained about the chicken and they all ate every piece given to them. So delicious!! Anxiously awaiting your review of the Traeger vs Camp Chef since we are looking at a pellet grill. Leaning toward the new Camp Chef Woodwind, since it has a fan to circulate the air, plus it now comes with their new SG (Slide and Grill) feature. I promise, it’s coming soon! This was absolutely delicious! My kids loved it too! At my husband’s request, i am going to make it again next week for my in-laws. Winner, winner chicken dinner! Happy you guys loved it, Kelsey! I’d probably try skillet over oven…maybe pan fry the chicken pieces and then toss with the reduced sauce? Can you just use chicken tenders instead? You could try – I’d suggest cutting the brining down a bit, especially if the chicken tenders you are using are thinner and kind of a bit fragile in thickness and texture. I’m new to brining and I’d like to turn this recipe into chicken kabobs. If I cut the chicken into smaller chunks would that cut down the brining time? How much? I turned your grilled Hawaiian chicken into kabobs and my family loved them! Thanks! Yes, I think so (I’m not a brining expert but that’s what I would do). I think if the pieces were in 1- to 2-inch chunks, I’d only brine for an hour (maybe two hours max). We make your rock salt chicken on our Traeger and we LOVE it! I would love to know what you cook on your smoker. I make that rock salt chicken on there, too! So yummy! I use it for all my grilling recipes and a lot of pork tenderloin recipes on my blog. I’ll have to get a big list together and post about it. Made this last night for dinner, and we LOVED IT!! Wish I could give it 10 stars. Everything about it was easy and perfect. I won’t be surprised if I’m making this weekly. Thank you for all your hard work to make this blog and share your incredible recipes!! So happy to hear this, Natalie – thank you so much! Hi Mel. Absolutely love your recipes. Just wondering why your brine would be enough for up to 4 lbs. of chicken when using only 2 lbs. I generally use 1 cup of water with other ingredients per chicken breast and has always been more then enough. Does this have something to do with the flavoring ? Hi Debbie – mostly for flavor, but you could definitely try cutting down the brine and see if the flavor stays the same. Thanks Mel for the quick response. Will definitely follow the recipe. I only questioned it so that i’d be able to change it for smaller or larger quantities of chicken. YUMMIEST CHICKEN EVER! I used chicken thighs because that’s what I had in my fridge. Otherwise I kept everything the same. So so yum! Can’t wait to eat this all summer! GREAT idea to use chicken thighs, Christina! So happy you loved it! Just made these…yum! During the summer I often search for “grilled chicken” on your site to get new ideas (btw, love love love 2011’s Teriyaki Chicken with pineapple juice!). No searching today! As fans of your baked Sweet and Sour Chicken, I knew these flavors would be a hit. And to your readers hesitant about all that cider vinegar….don’t be afraid, the strong smell disappears and the sauce is divine! Love, love, love that you made this so fast AND took the time to check in. Thank you, Sandra!! Me again. Last dumb question from a novice cook. If I am using fresh chicken breasts, do I slice them in half so they are thinner and also cut them in 2 inch strips? I am excited to make this recipe. Can you recommend a soy sauce that you like to use? Also, are you a fan of the traeger grill? Hi Karen! Yes, I love the Traeger grill! I’ll be doing a more in-depth post soon about the ins and outs of pellet grills, what I love about them, and some other pros and cons. I like to use the Trader Joe’s brand of soy sauce or just regular ol’ Kikkoman. 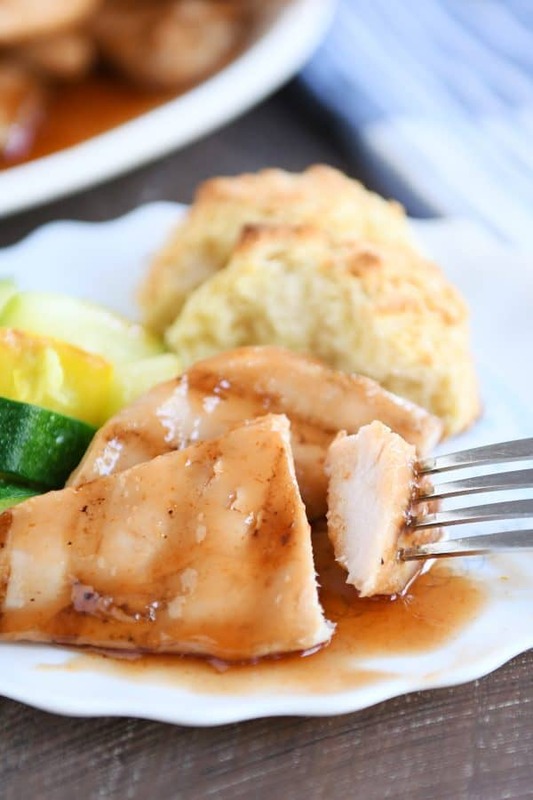 I often use low-sodium soy sauce, but in this recipe, I used regular soy sauce. 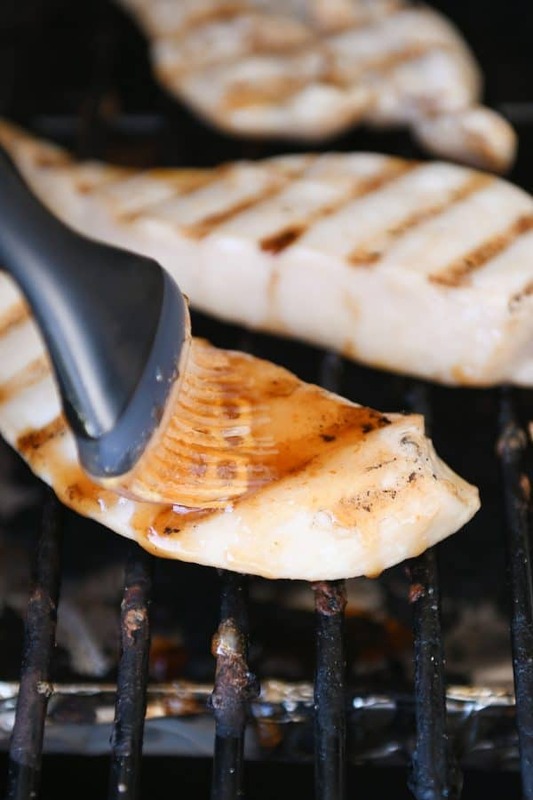 You can either slice fresh chicken breasts in half to form two thinner cutlets OR pound them thin (without slicing them); there’s no need to do either if they are already thin cut chicken breasts (about 1/4-inch thick or so). And yes, I like to slice the thin chicken breasts in 2-inch strips to form pieces of chicken that are more like chicken tenders. Does that help? Could you please make more gluten free recipes? This recipe could easily be made gluten-free by subbing in a gluten-free soy sauce and making sure the ketchup used is gluten-free. I wrote the earlier post. I meant to say how many did one recipe serve? I don’t know if Boise will qualify you for remote wilderness…. but I am super excited to try it. I made sweet and sour chicken classic and took it to a family with a new baby last week. Rave reviews, no surprise. Sounds wonderful. We will be having this for a family gathering on Sunday. Did you thaw the Chechen breasts you bought from Costco? How many did one serving feed? Thanks Mel. Hey Amy – yes, I thaw the chicken first before brining. This recipe serves about 6. If I have less time to brine, 30-60 minutes, will it turn out ok? Or do I need to make adjustments to the brine? I’d love to try this tonight but can’t keep the family hungry for too long once I get home! Hey Erica, I’d say to give it a try! The chicken may not have the quite the same flavor, but if you have an hour, I think it’ll work pretty well. I ended up with almost 90 minutes to brine thanks to an assist from grandma . Came out fantastic! Will definitely be adding to our weekly rotation with double the sauce because it was so good. Love your recipes! On this one, if the chicken breasts are the frozen ones from Costco, they have a salt solution in them – do you use this type of chicken or the fresh that does not have any solution injected. That’s a great question, Beth. I’ve made this a couple of times (with the Costco chicken breasts) and the first time it was too salty, so I’ve dialed down the ingredients to compensate for that. There definitely is a salty bite to the chicken, but it works very well with the sweet sauce.